The Whirlpool Galaxy, M51, seen by Hubble in 2005. The Hubble Space Telescope has taken about 750,00 images in its 15 years in space. Celebrating the launch on April 24, 1990, Hubble officials released two more pretty pictures. The images were to be released Monday, but they were provided in advance to the media and were posted to a British web site Friday afternoon. SPACE.com contacted the Space Telescope Science Institute, which operates Hubble, to verify that an embargo had been broken. While Hubble's future is uncertain, its capabilities are unquestioned as the sharp-eyed observatory continues to produce stunning photographs of faraway places. The new images are fresh views of two of the most famous objects previously photographed by Hubble. One picture is of the well known Eagle Nebula, also called the Pillars of Creation. It is a stellar nursery. Its energy creates a billowing tower of cold gas and dust that is 9.5 light-years high, about twice the distance from our Sun to the next nearest star. Stars in the Eagle Nebula are born in clouds of cold hydrogen gas, chaotic neighborhoods where energy from young stars sculpts fantasy-like landscapes in the gas. The tower may be a giant incubator for those newborn stars, previous Hubble images have shown. Our own Sun may have been born in a similar chaotic place. A torrent of ultraviolet light from a band of massive, hot, young stars (out of view above the image) is eroding the pillar. 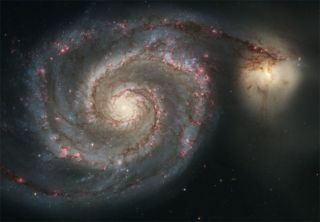 The other picture is of the spiral galaxy M51, also known as the Whirlpool Galaxy. This sharpest image ever made of M51 illustrates a spiral galaxy's grand design, from its curving spiral arms, where young stars reside, to its yellowish central core, home to older stars. The arms are star-formation factories, compressing hydrogen gas and creating clusters of new stars. In the Whirlpool, the assembly line begins with the dark clouds of gas on the inner edge, then moves to bright pink star-forming regions, and ends with the brilliant blue star clusters along the outer edge. Some astronomers believe that the Whirlpool's arms are so prominent because of the effects of a close encounter with NGC 5195, the small, yellowish galaxy at the outermost tip of one of the Whirlpool's arms. At first glance, the compact galaxy appears to be tugging on the arm. The new images shows that NGC 5195 is passing behind the Whirlpool. The small galaxy has been gliding past the Whirlpool for hundreds of millions of years. Among Hubble's greatest achievements is an ongoing set of observations of supernovas that shows the universe is not just expanding, but doing so at an ever-increasing pace. The blockbuster finding means something called dark energy, which scientists know almost nothing about, is working against gravity -- and winning. Hubble sees things near and far and in between. Last year Hubble cranked out the Ultra Deep Field, which contains a zoo of galaxy types and, astronomers expect, the most distant objects ever photographed. The light from the young galaxies traveled for more than 13 billion years to reach Hubble's digital camera. Somewhat closer to home, Hubble in 2001 made the first direct measurements of the composition of a planet's atmosphere outside our solar system. Pockmarked with meteoroid impacts, Hubble has over time clocked radically changing winds on Saturn and shown Neptune to have seasons. It spotted mysterious light flashes on Jupiter, and made stunning portraits of Mars. Hubble is a joint project between the European Space Agency and NASA. The observatory may be on its last legs. NASA currently has no plans to service the telescope a fifth time. Meanwhile, with its batteries and gyroscopes wearing out, the telescope will likely stop taking pictures in 2007 or 2008.